This Wednesday night at Yankee Stadium in the Bronx, the Boston Red Sox will play the final game of their 2012 campaign, contest number 162. The year began, as with all baseball seasons, in the hope that only April in New England can bring. Hope for a competitive team. Hope for the playoffs. Heck, maybe even hope for another World Series title. Remember? In the early spring just six months ago, our part of the universe thawed out and warmed up. In the blooming of the buds on the trees and the bulbs bursting forth from the chilly ground, we believed then that anything was possible. But now 181 days later the Red Sox have experienced their first 90 plus loss season in 46 years. This team is the worst BoSox contingent since 1966. But guess what? There is a cause to celebrate, always will be if you are a real sports fan, a fan, one who is in and at the game for the long haul. All nine innings, all 162 games and then back again to the next Opening Day in just another six months, April 1, 2013, at Yankee Stadium. No one bad year can ever change that or change me. 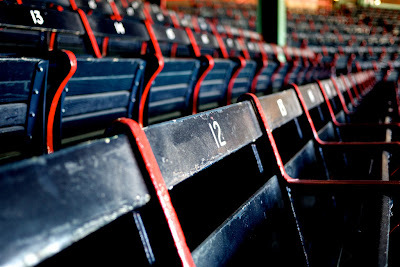 My birth as a fan began when I was seven years old in 1968 and discovered the Red Sox. That year I biked to my local CITGO gas station to purchase an official Fenway Park glass mug and I can still taste the cold chocolate milk I’d drink from that keepsake as a little boy. Fandom isn’t ever fickle. A fan is faithful. So I’m not ready to adopt another team to cheer for. I will still proudly wear my Red Sox cap out in public, head held high. These final weeks I’ve still tuned in to the game as I drive in my car, comforted by the familiar voice of Joe Castiglione, the crack of a bat on a ball, cheers for a great strikeout, boos for the other team. Yes this week I’ll pack away all my Red Sox hopes but only until the new season next year when it will all come back around. And then I’ll hope again. And then spring will come again. Fenway Park will echo again with the cries of “Beer here!” Moms and Dads will bring their excited sons and daughters to their first game ever. With wide open eyes and full hearts those kids will walk into a 101 year old cathedral of memory, just like their grandparents and great-parents did too. They will learn how to be a fan. A fan: not just for one game or one great championship run. Not just when the hits fall and the sun shines and the “W’s” pile up. A fan is finally only a true fan when they stick around for the hard times too. When the stars players break our hearts, when the bats swing and whiff, when the losses mount, when the team just does not have the horses or the hearts to win the race. Still you cheer. Still you hope. Still you anticipate beginning anew, the top of the first inning, no score yet. That’s true for sports. That’s true for life too. Because finally “the game”, whether between the lines or in the real world, matters in the playing and not just the winning. The game matters not only on warm spring days of hope but also on frosty October nights of disappointment, when the tarpaulin is rolled out one last time to blanket the turf and the winter nights settle in and New England turns towards the end of another season. “Wait ‘til next year!” Maybe a losing season is actually not such a bad thing. I know the more rabid fans will protest such competitive blasphemy, but life is finally life. The game is the game. Some days we win. Some days we lose. But the gift always is this—we get to play. We get to compete. We get to be a fan. Dependent (adjective) 1. relying on someone or something else for aid, support, etc. One of my favorite architectural gems is the Rhode Island State House in Providence, just down Route 95. “Little Rhody” boasts a grand capitol building, topped by the fourth largest freestanding dome in all the world. But it is what sits on top of that dome which has my interest these days, a statue called “The Independent Man”. Weighing in at some 500 pounds and 11 feet high, this lone man, herculean and powerful, perched 278 feet above the ground, is a symbol of human freedom and human independence. How we Americans love this image and ideal of a human going it alone, the lone man or woman who makes it all on their own with little or no help from anyone. The entrepreneur who starts a company from scratch in a garage and then reaps billions for herself. The solider who singlehandedly storm’s the enemy fort and saves the day. The cowboy who confronts the town bandit at high noon, shoots him (of course never in the back) and then rides off into the sunset, dependent on absolutely no one. Even his best friend is just a horse. Cue music. Roll the credits. Oh if only human life were that simple or easy. Sure I strive to be as independent as the next person. I’m proud of the fact that much of what I’ve achieved in 51 years has come about because of individual effort and yet the truth is: I didn’t get here on my own. Not by a long shot. I’m not only self made. I’m God-made. I’m communally created too, the product of a family that loves me, a faith which sustains me and even a government which at times has really helped me. I depended and still am very dependent upon people and institutions, even here in the land of the free. I need the whole society to support me at times on my life journey. I’m dependent. I am “The Dependent Man”, though something tells me I won’t get a statue anytime soon. For these days the notion of depending upon others, especially the government, is viewed with derision and contempt in many political circles and on too many campaign trails. Candidates decry a so-called “culture of dependence” which has overtaken America. Pundits speak of entitlement programs like Medicare (health insurance for the old), Medicaid (health care for the poor) and Social Security (pension for the aged and disabled) as if these are a civic plague, examples of human weakness and an inability to just pull ourselves up by our bootstraps. To depend upon Uncle Sam for a check to help pay the rent or to buy some food for your family—is that now a moral failing? To depend upon the government for some extra help to pay for fuel oil in the winter or to receive unemployment compensation when you just can’t find a job--is this so terrible? To depend upon Beacon Hill or Washington D.C. for assistance, in the hope of helping the “least of these” our neighbors: the poor, the disabled, the homeless, and the sick. Is this really so unreasonable? Me? I know my family and I are dependent upon the government sometimes. My retired Mom and Grandfather receive excellent healthcare courtesy of a federal government program. As a veteran my father was very well cared for in the last years of his life in part because of the Veterans Administration. I went to a public university because my neighbors in Massachusetts paid taxes making tuition affordable for a middle class kid. I went to grad school because Uncle Sam backed my loans. Parishioners of mine, between jobs and struggling, never lost their health insurance because the state I live in guarantees health care for every citizen and part of that tab is picked up by the feds. I once worked with developmentally disabled adults whose housing costs were subsidized by the government. Otherwise they would not have been able to live and work on their own. Are all of these folks really “moochers”? I’m no socialist, to use the pejorative swipe some so casually toss around. I work for a charitable institution which also takes responsibility for doing our small part in housing the homeless and feeding the hungry. I too worry about rising government debt. I know that all our entitlement programs need to be reformed both through reasonable tax increases and benefit cuts, something neither Presidential candidate has the courage to say out loud. I get that. 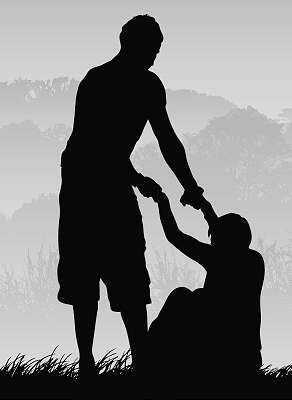 But as a person of faith I passionately and fully believe that our nation has a moral and ethical responsibility to help folks who are in need, who are hurting, the ones who have been beaten down by the harder edges of bare knuckles capitalism. No political philosophy should ever trump our communal commitment to show compassion to our neighbors. No miraculous economic system or “opportunity society” will ever be able to completely eliminate human suffering, poverty or the dependency of the few on the many for help. Sometimes I’m independent as a human being and citizen. But sometimes I and millions of our fellow citizens are dependent and just need some help and care from the government. When did that become such a civic sin? I checked my watch today to see if there were perhaps more than just twenty four hours in the day, that maybe 13 o’clock or 14 o’clock had appeared magically overnight, giving me a few more precious hours to manage all that I have to do and accomplish. Because you see I’m busy. Very busy. So if I could only extend the day, squeeze just a bit more time from time, then I’d finally not be so…well..busy. Right? Part of it is this time of the year, mid-September. Everyone is busy. Summer is over, regardless of whether or not the calendar claims otherwise. School kids march home from classrooms like modern day suburban Sherpas weighed down by their overstuffed backpacks. Moms and Dads drive all over New England, delivering children to sports games and music practices and math tutoring and plays. I see these forlorn parents in parking lots, minivans idling away, as they text on smartphones and double check just where they are supposed to go to next. Who knew so much of adult life would be spent in the car as our second home? And work, if it slowed down at all last summer, is right back up to speed too. Emails overflowing the in-box, anxious missives awaiting a response. Cell phones chirping, laptops cranking, offices humming. The line at Starbucks is long again and traffic is jammed not to the Cape but to Boston. There’s a reason American workers are among the most productive in the world. We are busy. Very busy. An interesting word, “busy”. Its roots are Germanic and it once meant “to be anxious”. For a time “busy” meant one was a promiscuous in the romance department! But in the early part of the 20th century “busy” came to mean its current usage: having a very full life, filling up our waking hours with lots of stuff to do. There are good things about being busy. It can keep us out of trouble, as in “idle hands make the devil’s work.” Busyness can give us a sense of purpose, a reason to bound out of bed in the morning. 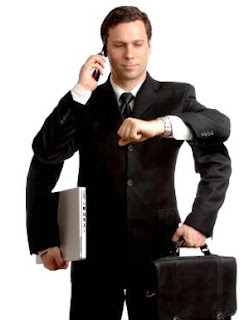 Busyness in the culture connotes success: the confident professional striving into the world, Blackberry in one hand, latte in the other, ready to conquer all that waits. There was a time in my life when I loved being busy too, scheduled to the hilt, calendar overflowing from sun up to sundown but not anymore. Maybe it is age. Maybe it is experience. Maybe it is wisdom. Maybe it is just exhaustion but I don’t think I want to be so busy anymore. And in talking to friends and family and the folks I serve as spiritual guide? These days when I ask: “How are you?” they almost always say, “Busy!” But when I ask them what might make them happier, they reply, “Just more time.” To be with loved ones. To play. To rest. To pray. And to not be so…busy. I’m not really sure how “busy” came to be the normal setting in our world. Yes some of us are busy at times because we have no choice: a single Mom raising kids and working full time. A harried worker trying his best to keep his job. The eager college student putting himself through school with a full class load and two part-time jobs. For some busyness equals survival. But sometimes I think we humans are also busy because we are afraid that if we slow down we might just question how crazily we live, maybe even wonder “Is this all there is?” So we just keep going on. We keep the kids busy in the prayer and hope that they won’t get into any trouble. We keep busy and end up not knowing our spouse or even children so well anymore. Worst of all we mistake busyness for meaning in life: that our lives must matter and make a difference because, “Hey—I’m really busy!” That’s my sin. But there is another way to live and not be so busy and it all starts with the notion of a day, just one day, this day. You see when God made that first day in the Creation story, it was just that, one day. Just one. “God separated the light from the darkness. God called the light ‘day,’ and the darkness God called ‘night.’ And there was evening, and there was morning—the first day.” From the start a day is just that one day: singular, solo, contained. 24 hours. 1440 minutes. 86,400 seconds. Can’t subtract anything from that and more important we can’t add any more time to that day either. We can try to get more organized, try to squeeze in more activities, download productivity apps, juggle calendars, sleep less, run faster, rush, rush, rush but at day’s end all we have is a day. An intentional spiritual life sees that one day as a gift from God, a miracle even. One day which is finite. One day which has never happened before and will never, ever happen again. When we see any day as “the day” which God has made and God has given, then maybe we can be a little less busy and a little more balanced about our time. So let’s be busy, sure. But let’s also remember that unchecked busyness takes a spiritual toll. That work only matters if it also gives us the chance to play. That activity only satisfies when it gives way to rest. That getting ahead for “me” has to be balanced with time to help and serve “thee”. God knows I’m busy. But God knows too that finally, all we have is one day. True confession: I’m relieved that the anniversary of the September 11th attacks will pass by in a relatively low key fashion this year. There are remembrances, large and small, but nothing like the nationwide commemorations last year on the tenth anniversary. Don’t misunderstand my relief for a lack of compassion towards anyone who lost a loved on that awful September day 132 months ago. I can’t imagine what life is like now for someone who said goodbye one last time to a spouse or child or friend in the days before or on 9/11. All Americans assumed a bright autumn day was just another normal day, but that normalcy was forever destroyed in the rubble of skyscrapers, in plane wreckage on a Pennsylvania field and in a damaged Pentagon building. We should always remember that day as a nation. Yet as an American and person of faith, I need to look for some good in the evil of 9/11, hope beyond the visceral horror, fear and shock I still experience whenever I see the images from that day. So this year, while remembering September 11th, 2001, I’ll also remember September 17th, 2001. There wasn’t much good news on that Monday. The stock market plunged 684 points, 7.1 percent, on its first day of trading post 9/11. Grim rescue operations continued at Ground Zero. Hundreds of thousands of stranded travelers were still finding their way back home. But in Washington, D.C., President George W. Bush carried out the most courageous act of his eight year Presidency. That day he visited the Islamic Center of Washington and greeted its leaders and members in front of the cameras for all to see. He spoke out forcefully and bravely against retaliatory acts of violence toward American Muslims and Arabs and of the need for interfaith understanding and peace. 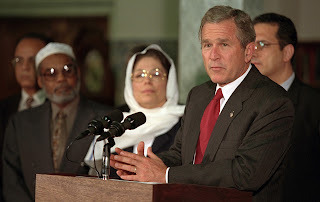 Yet Bush strode into this atmosphere of religious ignorance and hatred with calm and care, speaking as a deeply devoted Christian in defense of his Muslim brothers and sisters. It was the act of a true statesman and one I want to remember and more Americans should remember too, eleven years after 9/11. As one who was and is admittedly not the biggest fan of President Bush or his legacy, I have to say that this time he got it right: absolutely, positively, completely. In a recent New York Times article about Bush’s visit, Samuel G. Freedman wrote, “Eleven years after the fact, Mr. Bush has been treated like a prophet without honor in his own land. He was barely mentioned at the Republican convention last week….Yet there was always another side to Mr. Bush…his deep faith and respect for all religions.” Freedman notes Bush was the first Presidential candidate to visit a mosque and that on September 11, 2001 the President’s appointment schedule included a 3 p.m. appointment at the White House with a delegation of American Muslim leaders. So remember September 11th. But let’s remember September 17th too. Even the darkest days are visited with glimpses of inspired leadership and God’s light and hope for our far too often broken world.